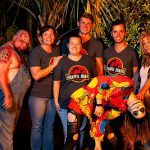 The Old Spanish Trail is a Haunted Attraction located in Jacksonville, FL. 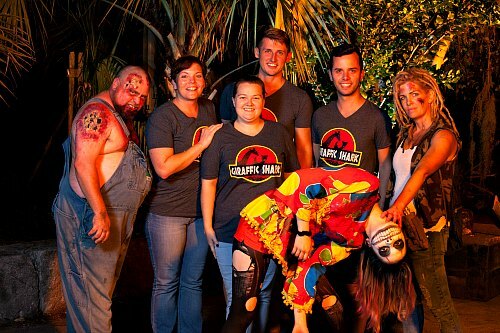 Team Giraffic Shark reviewed this attraction on October 21, 2017. THE OLD SPANISH TRAIL features one trail (over 15 minutes in length) with many scares, great sights and a fantastic time to be had! A multi-themed trail creates several immersive areas to walk through as the woods of THE OLD SPANISH TRAIL are explored. This trail completely changes each year, providing a high revisit value with a completely new layout, scenes, props and characters. This dedication to change is key to success, promising Guests an entirely new experience year after year that’s filled with fun, plenty of scares and driven by a phenomenal Cast of actors. The Cast of THE OLD SPANISH TRAIL is dedicated, passionate, and committed to their roles in the forest, delivering a great performance featuring the gamut of creepy, aggressive, and comedic characters. THE OLD SPANISH TRAIL showcases young children (especially in the creepy daycare scene) and novice performers as well as more experienced actors with many years under their belt scattered throughout the woods. With having so many performers new to scaring, a lot tend to resort to “easy” scares, including the fair amount of ear screaming. While off-putting as a whole, this unfortunate saturation was overshadowed by other performers creating unique and creative scares, such as swinging in from trees and sprinting through scenes to cause great distraction and misdirection. Of note is the gentleman who welcomes Guests to the trail. Posing as a park ranger/camp counselor type, he effectively and humorously delivers the rules, regulations and guidelines for the attraction. Also, the young parking attendant with the great creepy laugh is both helpful and friendly as a Customer Service employee, but also effectively delivers scares beginning within the first moments of arrival. Costuming for THE OLD SPANISH TRAIL, though not elaborate overall, was well thought-out and thorough with complete looks for characters. Even the parking attendants had costumes and makeup, creating a great first impression and fun surprise. Costumes are effectively chosen for their scenes based on lighting, scenery, and setting. Costumes have become distressed through natural means with cast crawling through graveyards and other scenes, thus becoming dirty, torn and covered with leaves, resulting in a great enhancement to their looks. Finding THE OLD SPANISH TRAIL is a breeze, as it is clearly marked with a lighted construction trailer sign and GPS directions direct to an accurate location. Upon pulling on the property, there are aforementioned parking attendants to aid in the (free!) parking in a rather unmarked plot of land. The attendants prevent this process from being chaotic. Upon arriving at the ticket booth, all staff are friendly, smiling, welcoming and eager to answer any questions, as well as tell you everything they have to offer (including some fabulous-smelling BBQ). After exiting the haunt, our host, April, spent quite some time describing the history of the haunt, as well as operational and creative details and processes. As performers came inside for the night, all were friendly, smiling and not a single negative attitude or less-than-perfect encounter was experienced. THE OLD SPANISH TRAIL is simply in the middle of nowhere, adding to the atmosphere and location of the haunt. On the property is a historic building, providing a creepy icon for the location, though unfortunately not used in the haunt at this time. Taking place in the woods, distant sounds can be heard along with screams, lights flash and smoke rises through the branches. All of this is perfect for building the tension and helping to prepare Guests by building the mystery of what lies ahead in the woods. THE OLD SPANISH TRAIL utilizes primarily traditional special effects to deliver a solid haunt with great scares. Scenery is well executed, providing great variety and difference in scenes and adding interest, not allowing any surrounding to become comfortable. While scenic is well done, the props and set dressings really sell the locations and realistic appearance with strong attention to detail. Scenes are well lit with strategic lighting effects to deliver certain aesthetics throughout the trail. One favorite effect was the preview over the fence into the graveyard with the girl in white featured in a blinding white strobe light, creating an eerie preview of that scene. Also well done is the combination of lighting and fog in the med tents. THE OLD SPANISH TRAIL takes traditional, ‘old-school’ effects and does them well, making solid themed scenes with complete immersion for Guests traveling through. THE OLD SPANISH TRAIL travels through many different scenes and themes throughout the trail, avoiding one theme for the entire haunt. Cast is dedicated to delivering scares in THE OLD SPANISH TRAIL. Since there are very few special effect-driven scares, the Cast steps in and fills that void to create more visceral, realistic renditions. Because of this, the scares are more focused and personalized rather than waiting on a pre-programmed special effect to scare Guests. Top scary and creepy moments include the tree swingers, the cemetery contortionist, the little (clown?) with glowing red eyes and the daycare “car push”, where a Fischer Price car seemingly crosses Guests’ path on its own. High success is also driven by Cast not afraid to get dirty, often crawling, sliding, and popping out from dirt patches and piles of leaves. THE OLD SPANISH TRAIL provides an above average walk-through time of over 15 minutes. With a moderate ticket price, THE OLD SPANISH trail is definitely worth the money, especially since the money is going back into restoring the historic building on the property. Space is well utilized throughout the trail, providing an adequate vendor space as well as a great layout in the trail, including tight passageways, but also some large expansive scenes as well for added interest and variety. If you are in the Jacksonville area, stop on by and see what’s going on at THE OLD SPANISH TRAIL! This place is simply incredible. Family owned and built its definitely much better than any Orlando …show more attraction! actors are top notch and the build is amazing. great time and very scary! OMG!!! Myself my Husband and friends really enjoyed ourselves we jumped the whole time. Very scary. …show more You definitely will Not be let down! !